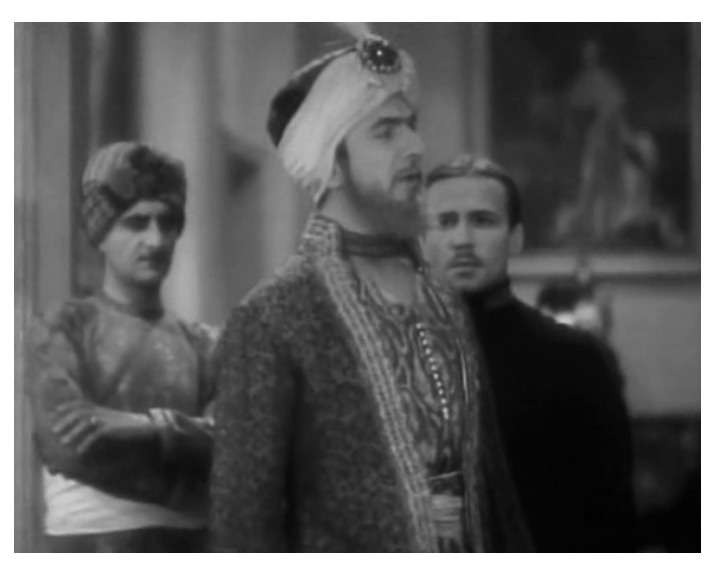 The third of Bela Lugosi’s four colour films. 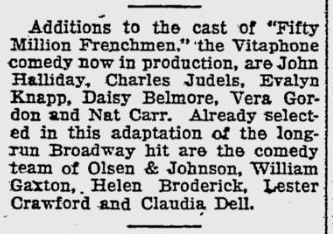 Although based on Cole Porter’s stage musical of the same name, Warner Brother’s cut all of the musical numbers from the film before releasing it in America due to a loss of public interest in musicals at the box office. It was released intact in other countries. Only a black and white print of the American cut release is currently available. 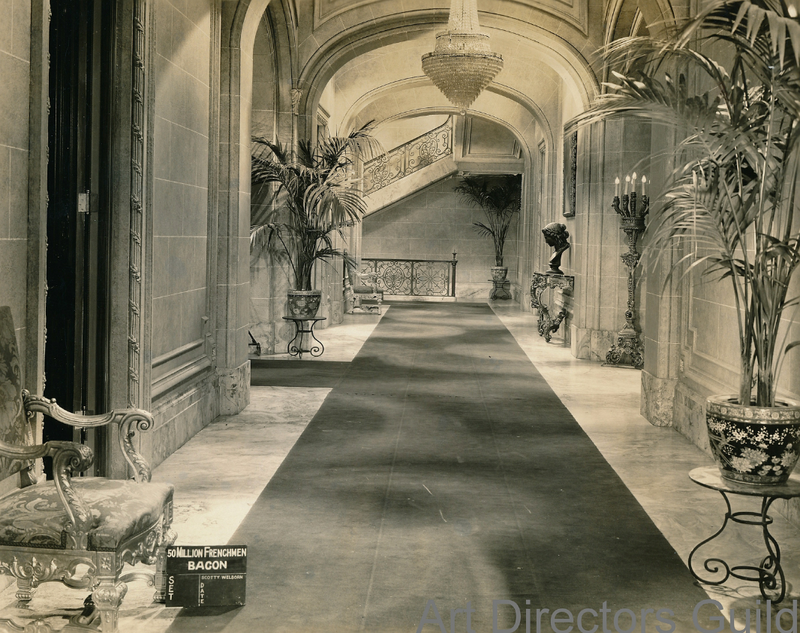 It is unknown if a copy of the uncut Technicolor original has survived. 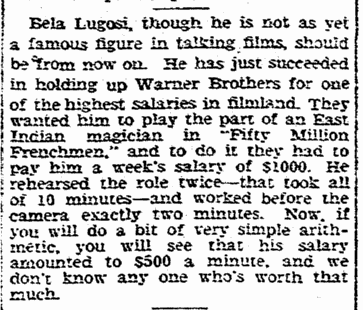 Bela Lugosi is reputed to have been paid $1,000 for his brief unbilled performance as a magician which was filmed prior to the release of Dracula. 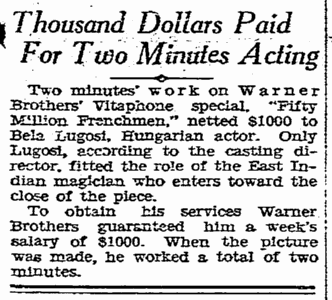 Two minutes work on Warner Bros’s. 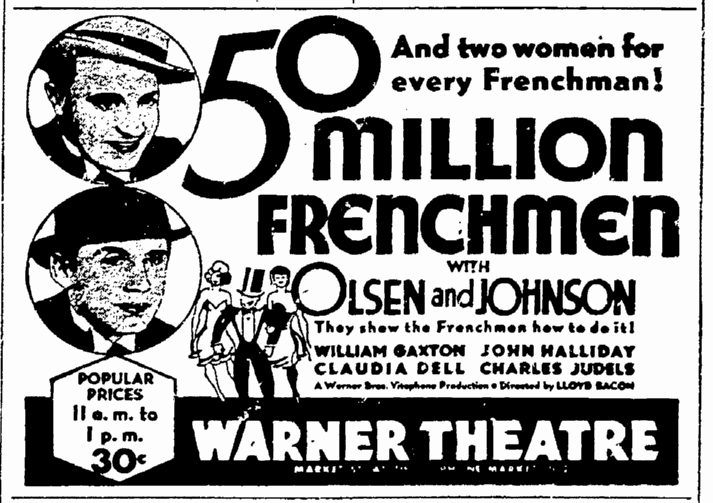 First National Vitaphone special, “Fifty Million Frenchmen, netted £ 200 to Bela Lugosi, the Hungarian actor. 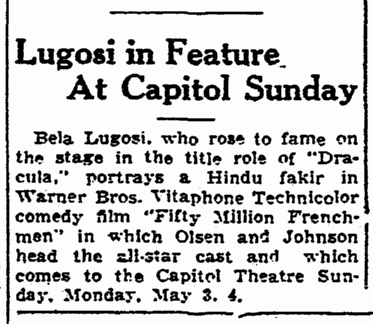 Only Lugosi, according to the casting director, fitted the role of the East Indian magic who enters towards the close of the piece. To secure his services, Warner Bros’s. First National guaranteed him a week’s salary of £ 200. When the picture was completed, he had worked a total of two minutes. 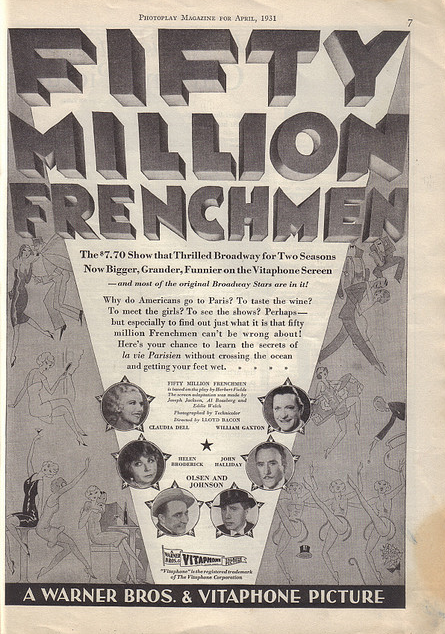 “Fifty Million Frenchmen” is photographed entirely in Technicolor. 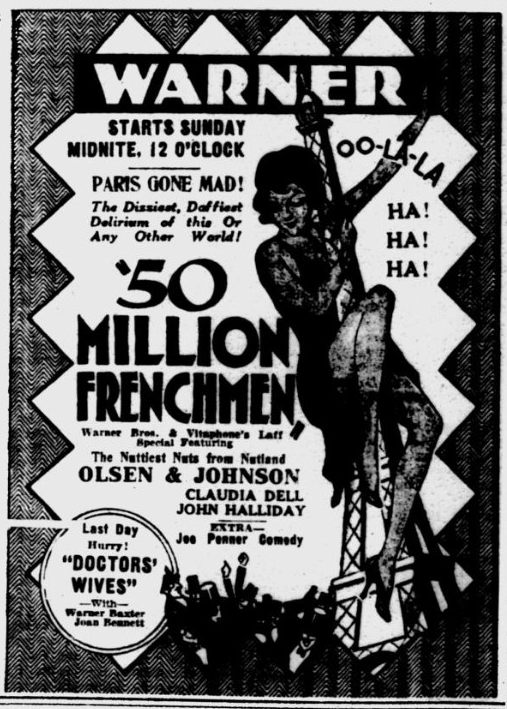 Only a few mildly amusing episodes are depicted in the Vitaphone-Technicolor version of the musical comedy, “Fifty Million Frenchmen,” which is now holding forth at the Winter Garden. 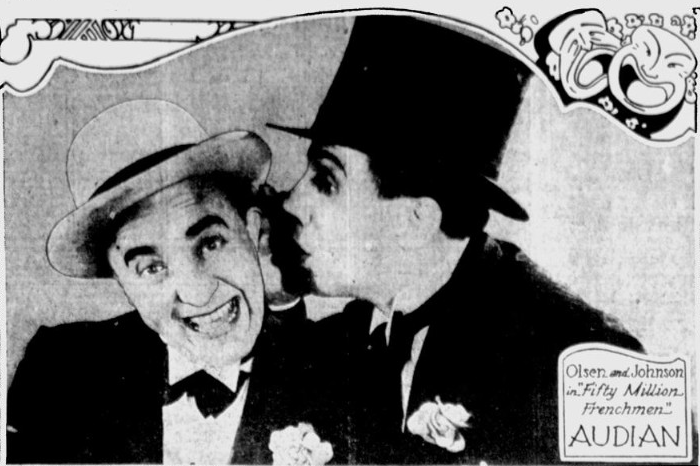 This film has been produced without the songs of Cole Porter and the prismatic work is at times poorly lighted. 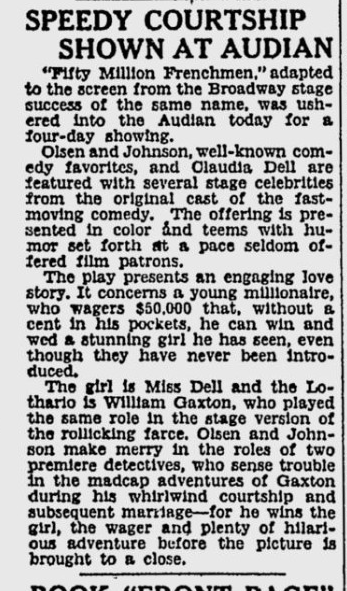 The players, including Olsen and Johnson, William Gaxton, Helen Broderick, John Halliday, Claudia Dell, go about their work with marked enthusiasm, but they are unfortunate in the vehicle. 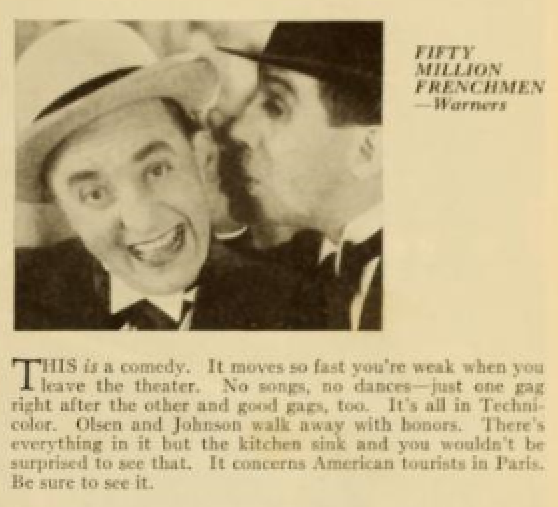 Lloyd Bacon directed this film and it should be said that its buffoonery aroused quite a deal of laughter in the Winter Garden at the opening performance. 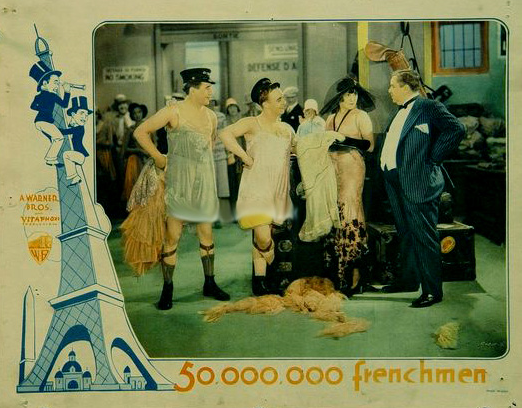 A closing sequence in which there is a chase has its ludicrous moments, for the Parisian policemen gradually increase in number as they run through streets and squares, leaping on the tops of congested automobiles and taxicabs, being stuck in the soft asphalt and then slipping on other sections of the roadway. Jack Forbes, played by Mr. Glaxter, is an unfortunate victim of a wager, that is unfortunate for a good deal of the time. 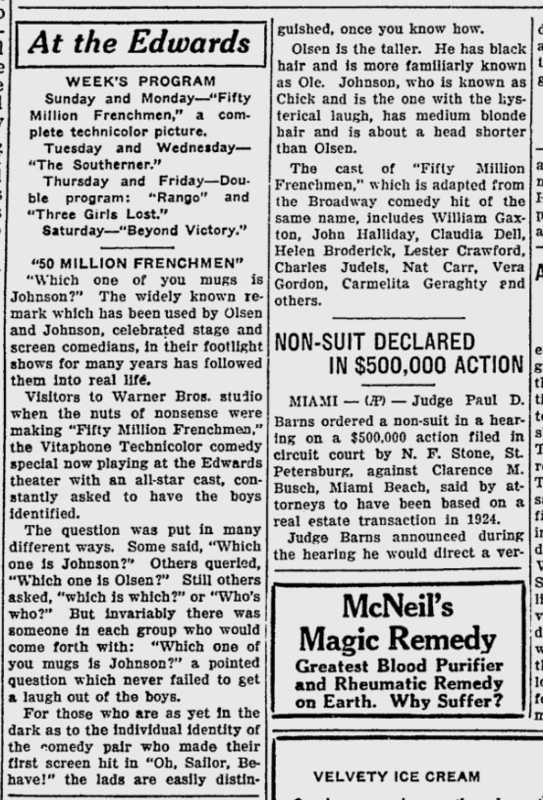 His rival bets him $50,000 that he cannot start without any money (in the French capital) and keep himself going by what work he can find and become engaged to the pretty Looloo Carroll within two weeks. The pseudo comic Simon and Peter, impersonated by Olsen and Johnson, are employed to follow Forbes and worry him. In the course of his anxiety over his love for Looloo, Forbes, in order to be presentable, borrows a waiter’s short coat and trousers and then tacks a pair of boys knickers to the back to look like tails. At the race course, which is quite well pictured, Forbes after thinking that he has won a tidy sum, hears that the horse on which he had made the bet has been disqualified and he tears up his betting tickets. Then he learns that the animal has won. This causes further disappointment and for some reason, not quite clear, Looloo is not particularly pleased with Forbes. And so it goes until at the last second Looloo is pacified and consents to listen to Forbes’s proposal of marriage. Miss Broderick makes the most of her rôle. Mr. Halliday also does what he can in his part. 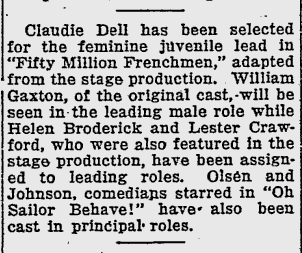 Miss Dell is very attractive and Charles Judels is faintly amusing as a Frenchman. 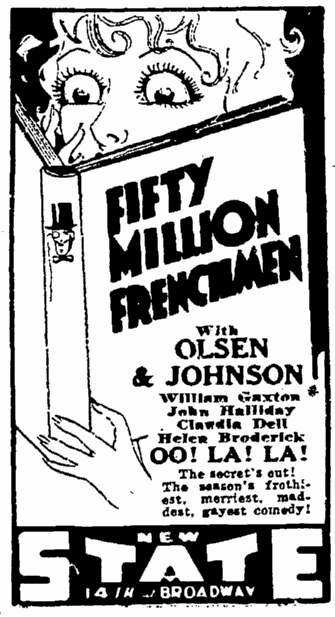 Olsen and Johnson are a trifle too boisterous to be funny. 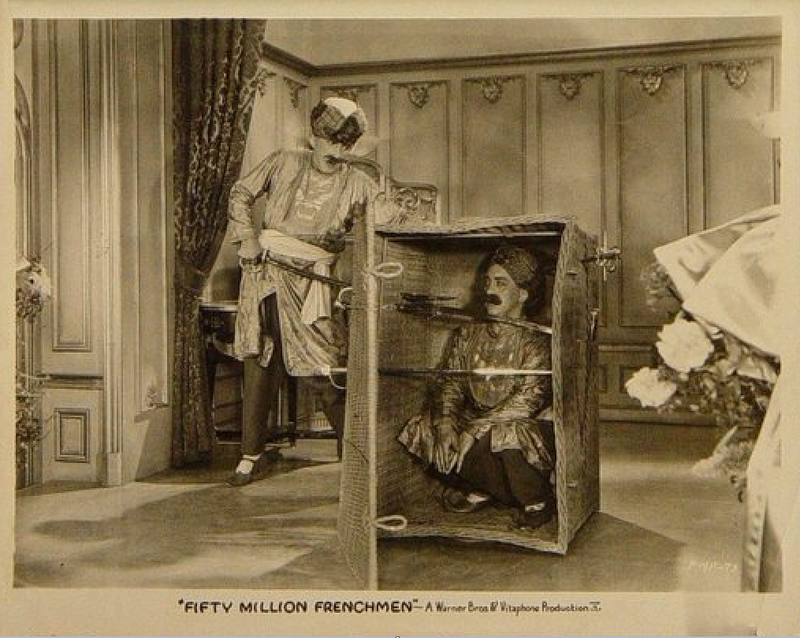 Buffoonery in Paris. 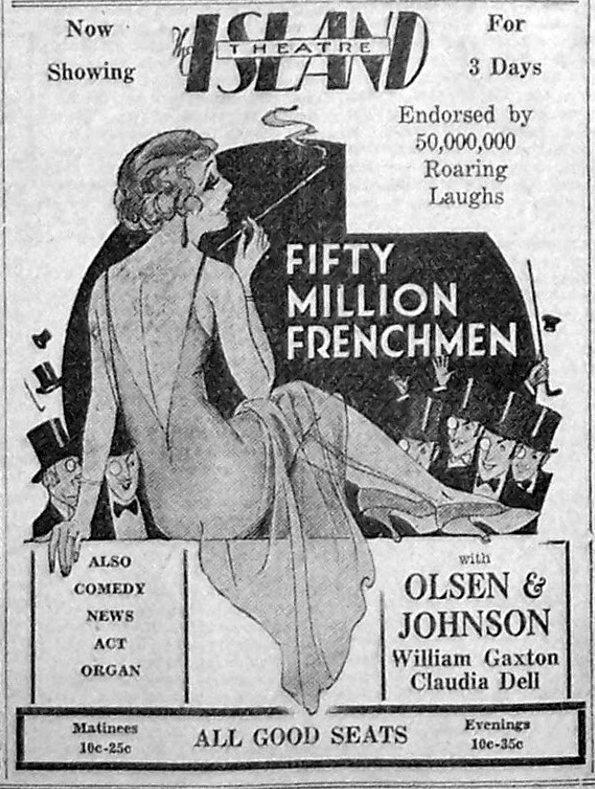 FIFTY MILLION FRENCHMEN, based on the musical comedy; directed by Lloyd Bacon; produced by Warner Brothers. At the Winter Garden. Simon and Peter . 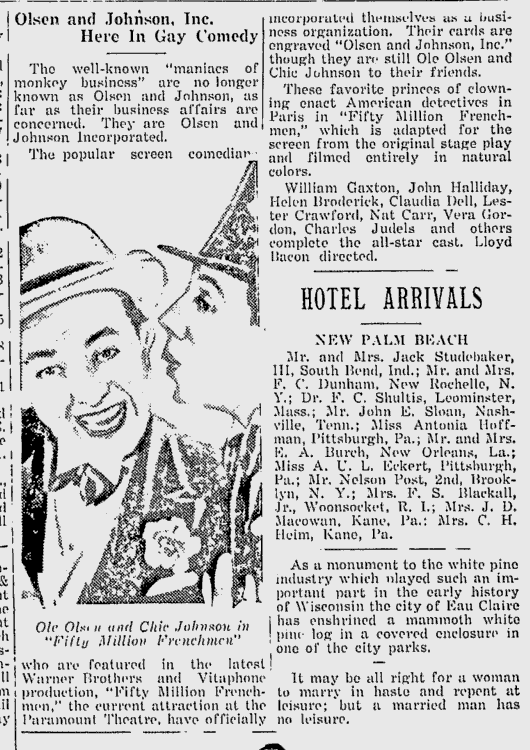 . . . . Olsen and Johnson Jack Forbes . . . . . William Gaxton Michael Cummings . . . . . John Halliday Violet . 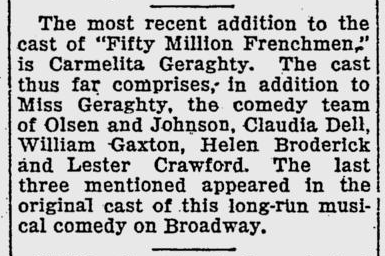 . . . . Helen Broderick Looloo Carroll . . . . . Claudia Dell Billy Baxter . . . . . Lester Crawford Pernasse . . . . . Charles Judels Marcelle Dubrey . . . . . Carmelita Geraghty Jewish Tourist . . . . . Nat Carr His Wife . . . . . Vera Gordon Their Son . . . . . Norman Phillips Jr.